This year we’ve had a lot a snow, and ice. Not as much as a lot of the country, but more than we usually get in Durham, NC. 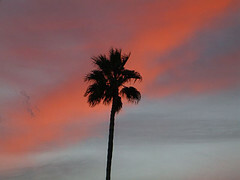 In 2006 we moved to Palm Springs, CA for a couple of years. We had two winters there. Now in January I sometimes miss the smell of citrus in the air. 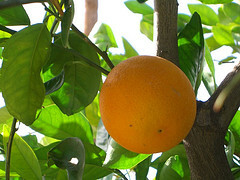 In Palm Springs the orange, lemons, limes, and grapefruit trees are full of fruit this time of year. 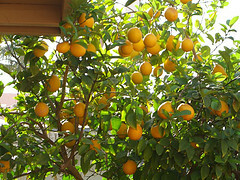 In our yard we had a small orange tree and a beautiful lemon tree. I used to pick lemons every day during the winter. I’d make fresh lemonade, I’d cook with them, clean with them, and I’d simply have bowls of lemons sitting around my house for the beauty and the smell. 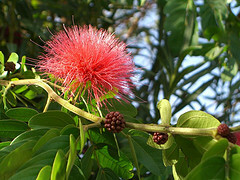 We also had this beautiful tree in our yard that they locals called Fairy Dusters. Living in Palm Springs gave me a great appreciation for warm winters. It was interesting though, you could get on the Palm Springs Arial Tramway to go up Mount San Jacinto (2,643 ft elevation to the station at the top). It would be in the high 70’s and when you got on the Tram in Palm Springs but by the time you reached the top it would be snowing. It was amazing. It really gave you an appreciation of just how different the climate in the world is, in just a few minutes you could go from the desert to a freezing mountain top. Cold weather to me means 1. more Meniere’s attacks. 2. more Migraines. 3. more general aches and pains (I have simply broken too many bones.) 4. my nose runs all the time. 5. I get a cough. 6. I see more mucus than I ever want. 7. I have to run the humidifier because the heat dries me out. 8. I get grumpy….well, even more grumpy than usual. Palm Springs, is a little different from actually living in the desert. It has plenty of water. They water the grass there all the time. They have no water shortage. I still think it is such a waste. There are more than 125 gold courses in the Palm Springs area (this includes the surrounding towns). All the water they use to keep those gold courses green it made it humid there all the time. We lived in the desert, yet it was humid. So in the summers when it was 125F, it was still humid out. That’s why most of the residents are “snow birds”. Many of the businesses shut down in the summer. Even some of the churches close in the summer. The summers were like living in a ghost town…..a very, very hot ghost town. Yes i am one of those who LOVE the winter. My Menieres is actually so much better as soon as everything freezes over. Some of the storms give me migraines but not as much as a summer thunder storm! This weekend is the girls weekend with my high school friends. I have missed the reunion for 4 years because of my disease, but not this year. Tomorrow we are meeting at a ski resort about 2 hours North of Toronto. I can’t wait. I am so thankful that I am still balanced enough to ski. Without the Meniett I don’t think I could do it! It would be tough living here if you couldn’t enjoy the outdoors. The winter is just so fresh and clean. We also love to snow shoe and when we just feel like having fun and not exercising, tubing is the way to go. Nothing like flying down a hill with no control on a rubber tube! I find running in the winter easier too. The humidity in the summer really bothers me but the dry winter air is great. I put spikes over my shoes and the run is great! Even our boxer loves the winter. He will play for hours in the snow but the heat drains him! So yes, I would like a warm vacation periodically but if I had to choose it would be winter all the way! Oh Deb, I wish I was more like you. Even my Oto says that many Meniere’s patients feel better in the winter. But here, a new front seems to be coming through all the time. For me it’s calmer during the summer, when everyone is praying for rain. Plus I’ve simply broken too many bones, so during the winter I just ache. You know even my mutt dog likes the summer more. She loves to just sun bathe, if she gets too hot she will dig a hole and lay in it, but she doesn’t want to come in. She’s so funny. During the winter, she wants her sweater! When it snows and she asks to go outside sometimes she’ll decide she can hold it for a little while longer. : ) She used to not be so bad when she was younger, she would play in the snow. But like me, with age, we’ve begun to hate to cold, more and more. As a native Californian, I have never experienced a cold and snowy winter. Sure, I have visited the snow in places like Big Bear and Lake Arrowhead, but never had to live with it for months on end. I never knew that it was humid in Palm Springs, perhaps because the last time I was there was in the middle of September. Curious to know why you left and headed to NC…. I love the different seasons and the changing of the climate over the year here in Sweden. 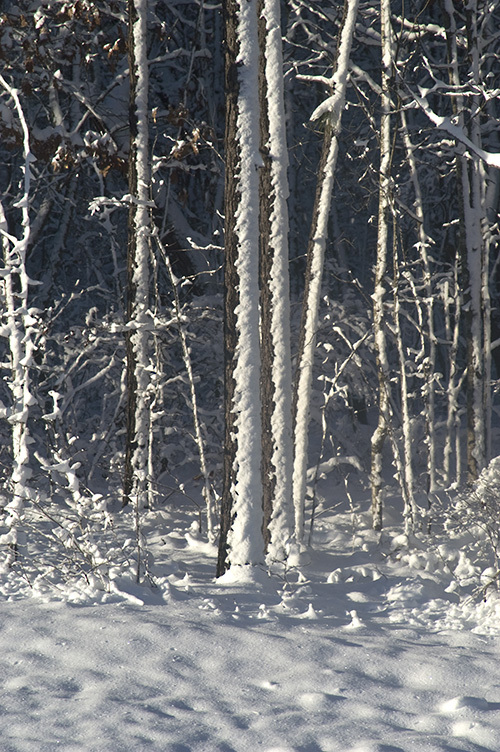 This winter started very early in November with a lot of snow and a low temperature. Some winters we have no snow at all. My head is better a cold clear day than a warm summers day waiting for thunder and rain. But the best is the spring season or early summer when it´s nice to be outside but not too hot. My dog loves the snow. He can stay out and play with a ball digging it into and out of the snow for hours. But he also loves water (he is a spanish waterdog) and likes swimming in the pool in the summer- that is something we share. What makes my Menière worse is a stressfull situation, something happening that I cannot control. I´ve had a few bad days now feeling like I´m going to fall all the time, and a few short spins in between. Now I´m waiting for better days to come. A bouquet with tulips on the kitchen table reminds me that the springseason is on it´s way. and of better days to come! I love tulips! They just make me feel so happy. I remember a painting of a tulip I did in college. It was more of a close up of the inside. (it was a Georgia O’Keefe assignment) I really liked that painting. I don’t know why winters are so hard for me. I’m much better in the summer. We have thunder rain storms, but often we’ll go so long without rain, I’m happy to see it. This winter has seen one front after another, plus when my head gets cold, I get a migraine. But spring is on the way. I live for fall. As long as it’s not a cold and rainy, it’s the one time of the year that I feel close to normal again. The humidity is gone and I can walk around farther without feeling like I could fall over. Even changes in weather rarely affect me in the fall. The summer is the worst for me. Especially if a hot, humid air mass comes from the south and hovers for a couple or few weeks. We’re in a valley so that affects things as well. Spring brings all the trees, plants and allergies back to life and I torture myself by going around and smelling all the lilac plants in the neighbourhood. Winter for us is a mixed bag for us. I think big, fluffy snowflakes and lots of snow on the ground on Christmas Eve and Christmas Day for the kids is the best. The rest of winter, the snow and ice can stay away. In Ottawa, the weather can change depending on how the wind blows. It can go from freezing cold to above freezing and after a few days of rain and melting snow the weather cools again and sidewalks get icy patches. As long as the sidewalks stay clear and ice-free, I’m OK. If not, I hibernate. It’s not worth the risk to have to move my head up and down to watch where I’m walking, get dizzy and lose my balance. I’m still trying to figure out why the weather affects me and my ears sometimes and not others. And strangely, sometimes when the weather changes, I’m not bothered but others in the house are. No set rules to guide us on that one. Maureen, I too am trying to figure out why the weather really bothers me sometimes and other times, it doesn’t bother my ears at all. Used to be, it was like clockwork, if the weather was changing..I would get a migraine, my ears would get stuffy….but now, it’s hit or miss. (however, my head still usually hurts when it starts to get all cloudy). I have Spring and Fall allergies, so both of those are icky, but the weather is nice. You know how I feel about winter. I ache, I feel bad…it could just go away. : ) But I do like it nice and warm. I have feel much better during the summer, but our summers are calmer I think, at least they have been the past few years. Fewer showers. Mostly, consistent weather.